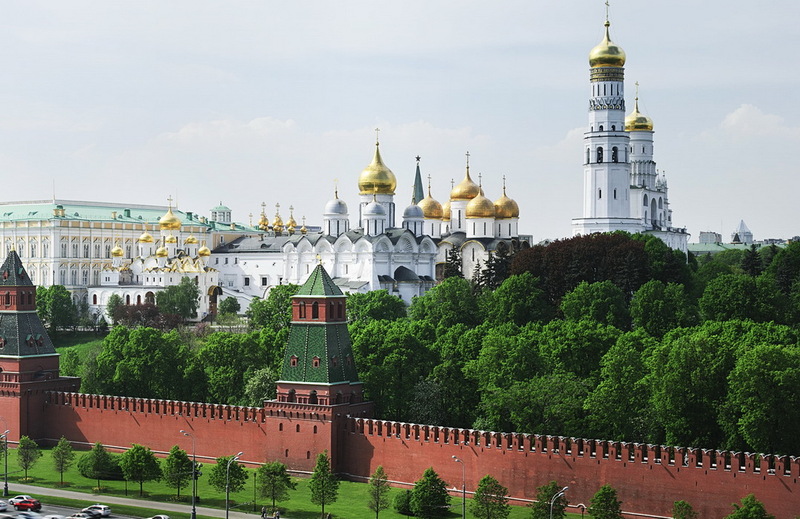 The Kremlin in Moscow continues to be a site that inspires many questions from tourists and I have to admit that it is a place that can be a little confusing. 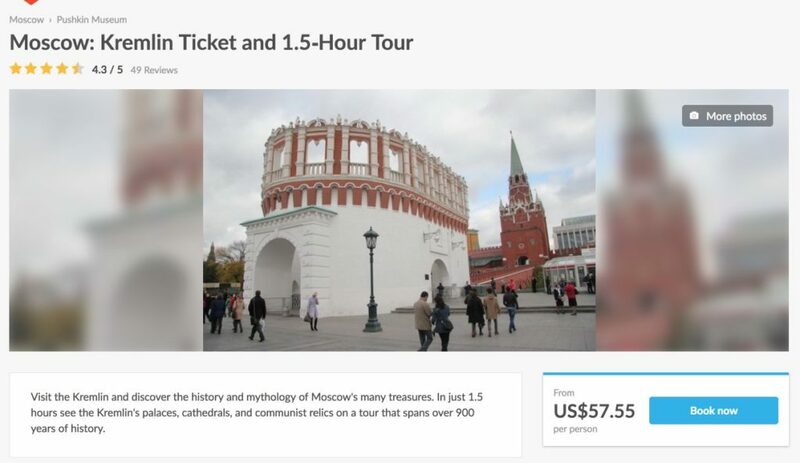 In this article, I try to explain what the Kremlin is, what parts can be visited, and how you can buy tickets online in order to avoid the long lines. 1. What is the Kremlin? 2. What can you see inside the Kremlin? 3. Where to buy entry tickets to the Kremlin? The word Kremlin means strength or fortified city. In Russia, you can find more than 20 Kremlins, the majority of which are old medieval cities that, with the passage of time, have grown and whose populations have extended far beyond their walls. 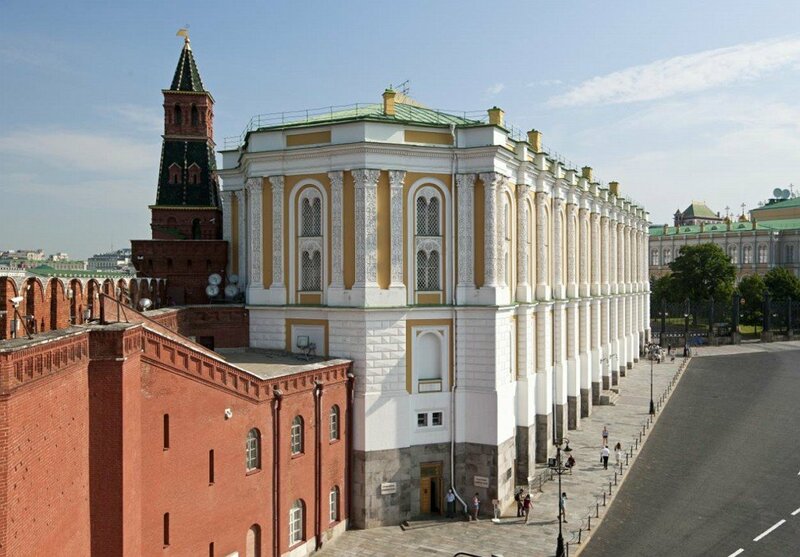 The most famous is the Kremlin of Moscow (Saint Petersburg does not have a Kremlin) whose significance since the end of the Soviet era has transformed and become synonymous with the Government of Russia, in the same way that the White House is with the government of the United States. The complex now includes numerous palaces and cathedrals, surrounded by the Kremlin Wall in which you can find the towers of the Kremlin. The eastern part borders the Red Square. 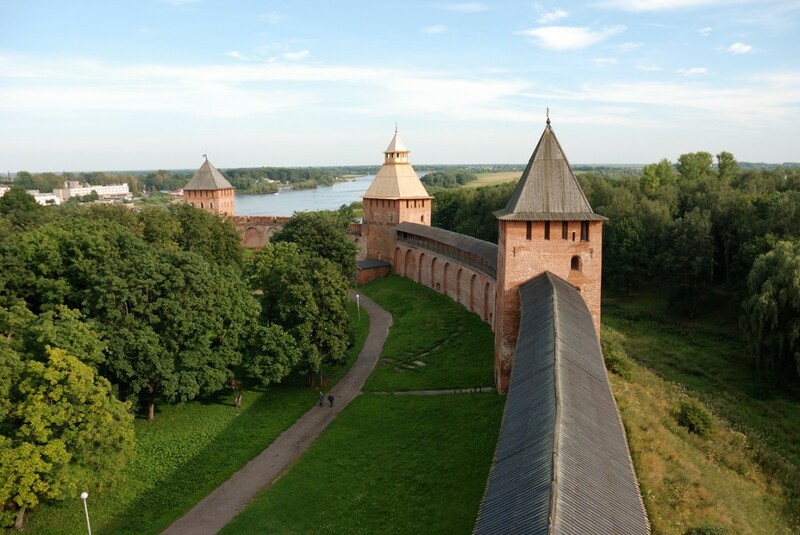 The current Wall was constructed between the 15th and 16th Centuries, but the original Wall was made of would during the founding of Moscow somewhere around the year 1147. I recommend visiting both the cathedrals square and the Armory. It’s worth it. Visiting the grounds of the Kremlin and the cathedrals square can take at least 2 hours, while visiting the Armory can take another 2 hours (at least 4 hours total). Keep in mind that the tickets are separate. You can visit one area in the morning and the other in the afternoon. Within the Kremlin, there are no restaurants nor areas where you can eat. If you do not have a lot of time, you can just visit the grounds of the Kremlin and the cathedrals. 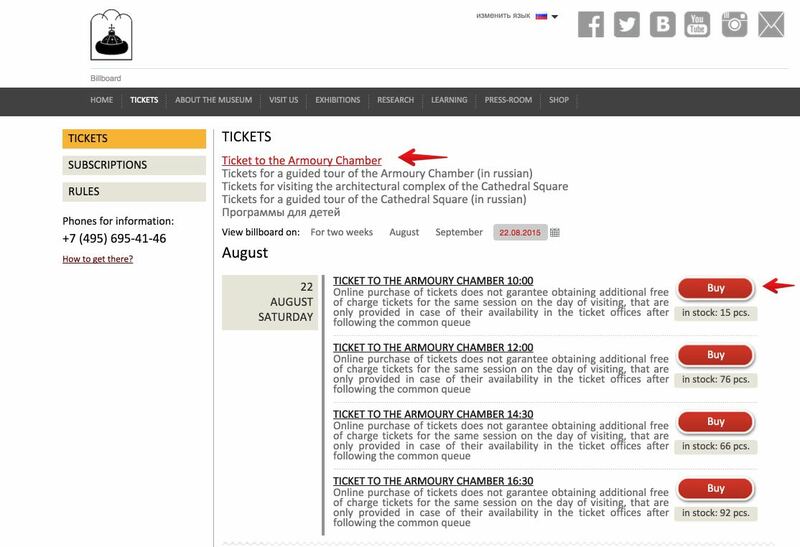 You can buy tickets online on the Kremlin’s website (later on I will explain how to do this) or at the ticket booths located in Alexander’s Gardens (number 37 on the map above). 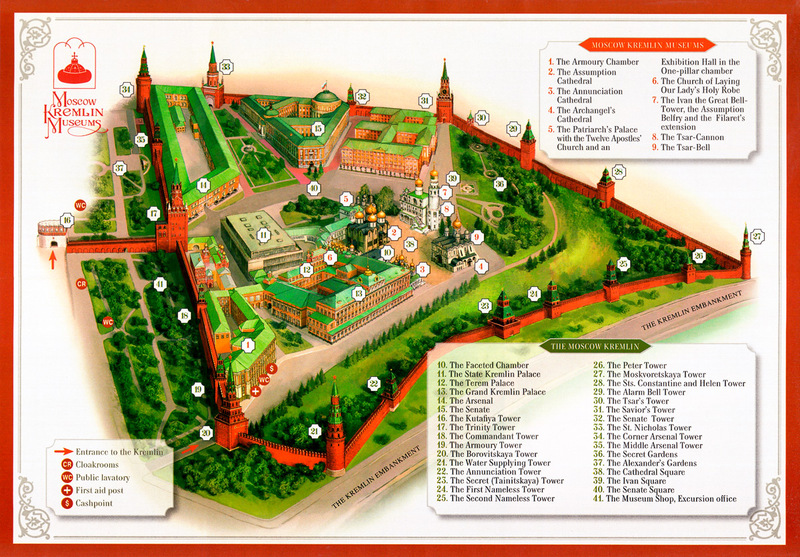 Once you have purchased your tickets, you can access the Kremlin via two places (identified by red arrows): by the Kutafiya tower (number 16 on the map), through which you can access the grounds of the Kremlin and the cathedrals square and by the Borovitskaya Tower (number 20) through which you can access the Armory (number 1 on the map). Keep in mind that the Kremlin does not have access to the Red Square except from the two entrances marked with red arrows. The Cathedral Square, a spectacular collection of 4 cathedrals in the same plaza. This plaza is famous for being the site of the coronations and funeral processions for all of the Russians tsars. In this day and age, it is used in the ceremony for the inauguration of the President of Russia (number 38 on the map). The Tsar-Cannon, a gigantic, 38-ton, 890 mm caliber cannon that was put into service in 1586 by the Tsar Fiodor I. 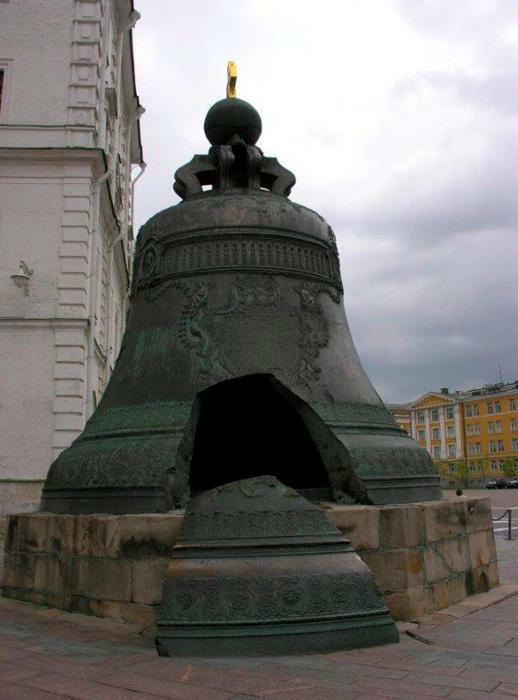 The Tsar-Bell, an enormous bell (said to be the largest in the world), that weighs 216 tons and has a diameter of 6.6 meters. It was formed out of bronze sometime between 1733 and 1735, and in 1737 it was broken during a fire. The Armory Museum. 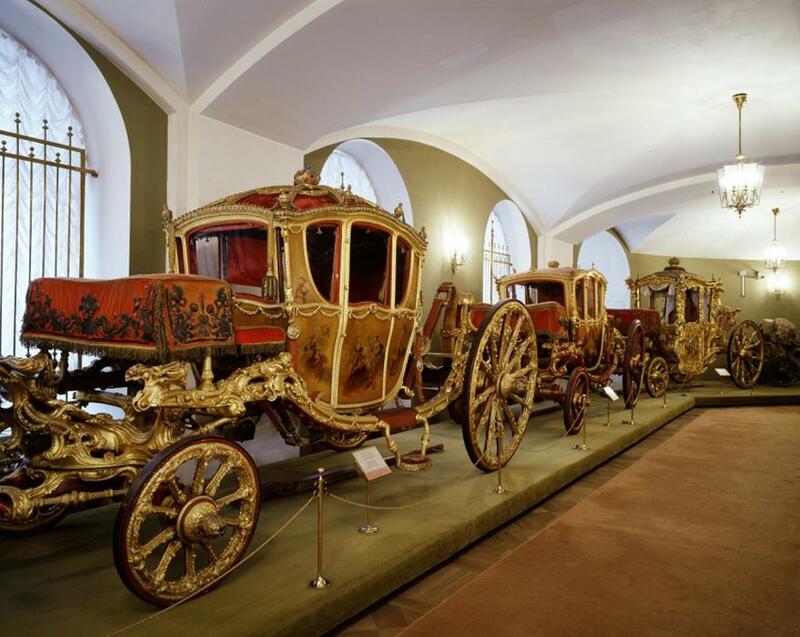 In spite of its name, it does not only house weapons but also an ample collection of works of art from Russia and Europe from the 5th Century to the 20th Century: one of the largest collections in the world of Faberge eggs, genuine carriages, crowns, tsars’ royal vestments, etc. This visit is essential. The entry fee for the general public is 700 rubles. Entrance is free for those younger than 16 years of age. The diamond fund. This is a separate exposition within the Armory and costs 500 rubles (you can buy a ticket once you are inside the museum). It is one of the most important diamond exhibits in the world, comparable to the Crown Jewels of Great Britain. The Grand Kremlin Palace, from the mid-19th Century, is the palace in which the President of Russia holds official receptions. 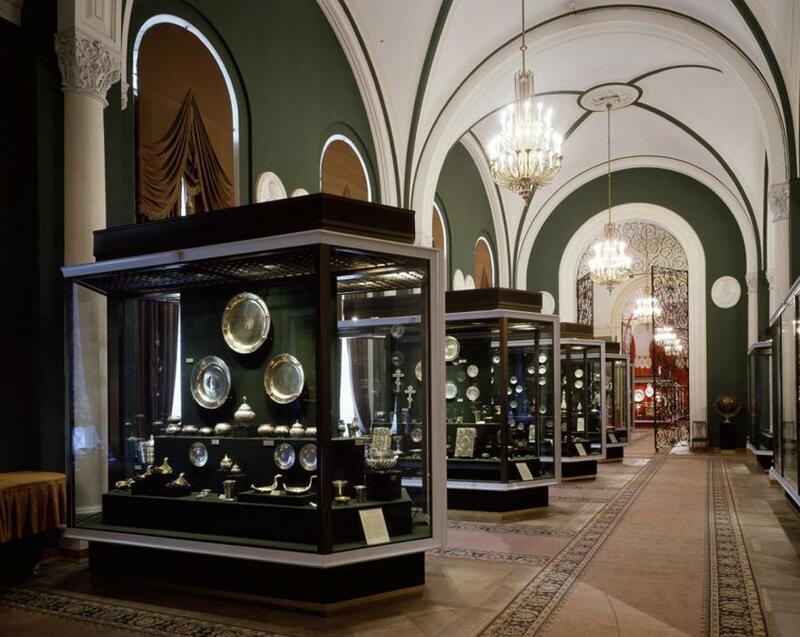 Visiting this site is possible in two ways: by invitation from the President of Russia or through requesting a private visit for a group (subject to availability), the base cost for which is certainly high. 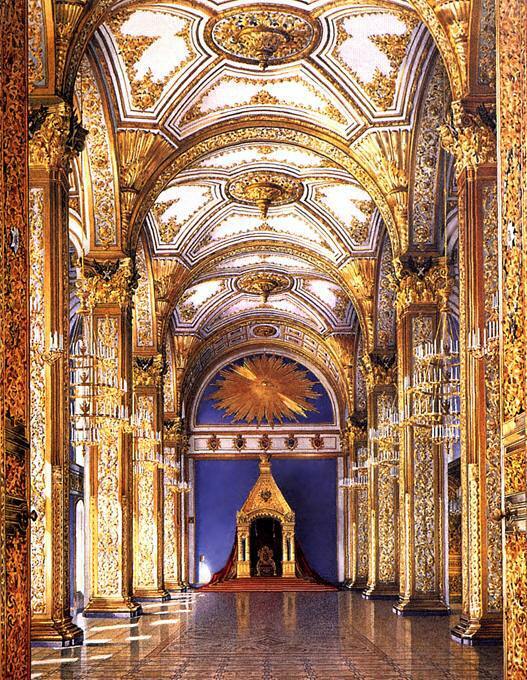 Kremlin State Palace. 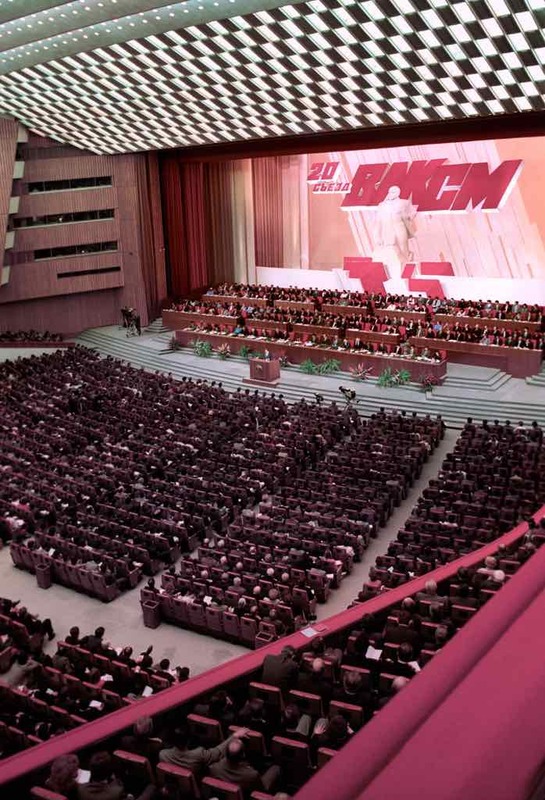 Constructed in 1961, it is used as the Congressional Palace and as a concert hall. Tickets for events can be purchased online or the ticket sales office. 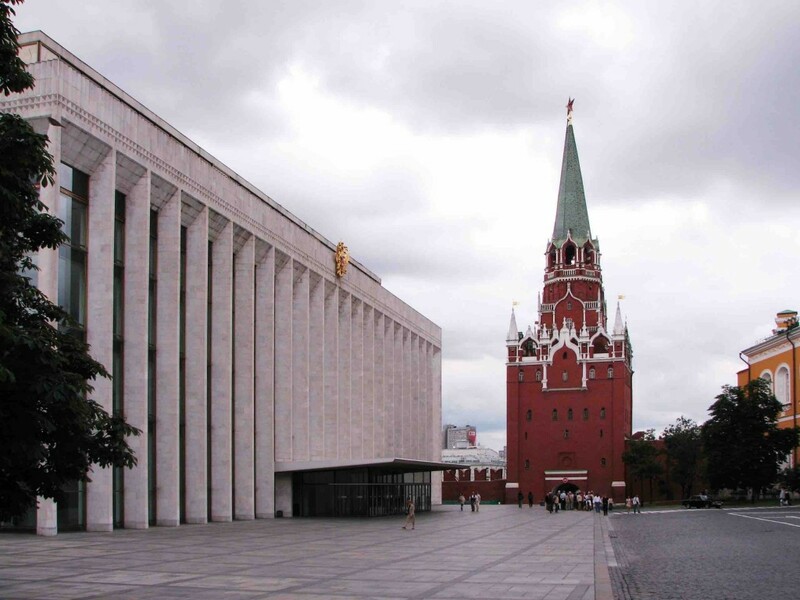 The Palace is the principal center for the Kremlin Ballet, one of the most important ballet companies in Russia. Presidential and administrative buildings. 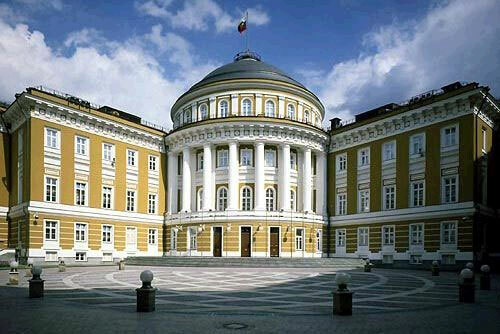 These are the buildings where the President of Russia works. They are made up of the Senate (the workplace of the President of Russia), the administrative buildings that belong to the Office of the Kremlin Command and the National Security Service, and the Arsenal. 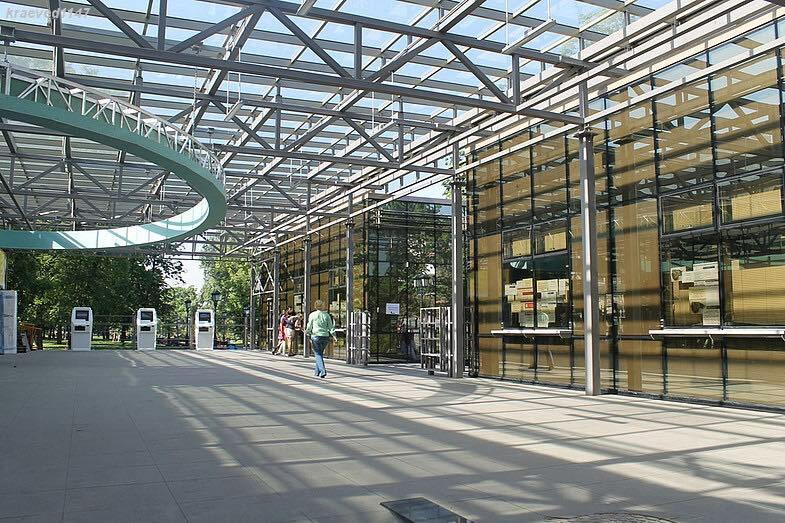 These buildings are not open to the public. They are outside the reach of tourists. The Armory is open for visitors from 10:00AM to 6:00PM with 4 exhibition sessions beginning at 10:00AM, noon, 2:30PM, and 4:30PM. The entry ticket, which costs 700 rubles, grants access to the Armory museum but not to the Diamond Fund, which costs an extra 500 rubles (you can acquire these entry tickets at the ticket booths outside number 4 and 5 but also you can acquire tickets inside the Armory as well). The Cathedral Square can be visited freely from 10:00AM until 5:00PM. The entry ticket allows you to visit all of the cathedrals and the museums within the Kremlin (except Ivan the Great’s Bell Tower). The entry fee is 500 rubles. 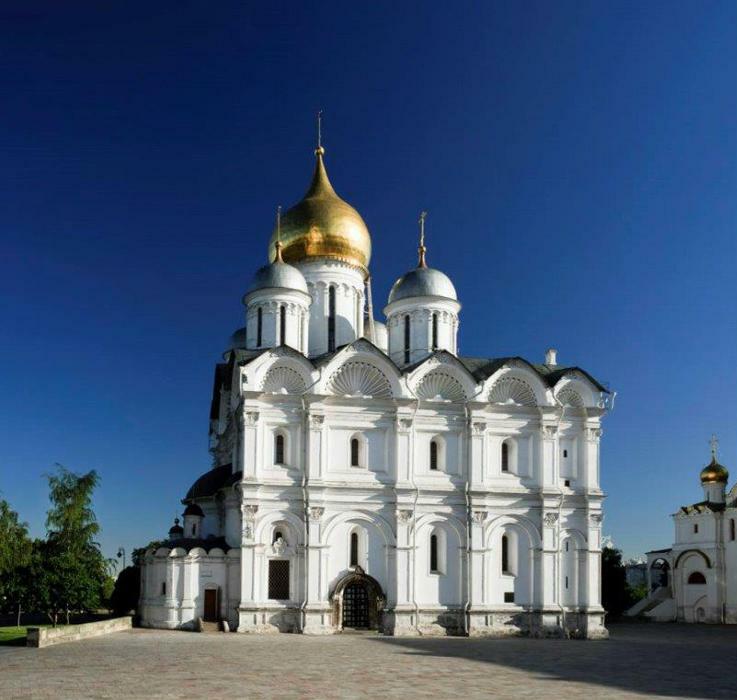 In order to visit Ivan the Great’s Bell Tower and its museum you must buy a ticket which costs 250 rubles (they cannot be purchased online, only at the ticket booths). There are sessions at 10:15AM, 11:15AM, 1:00PM, 2:00PM, 3:00PM, and 4:00PM with one additional session at 5:00PM from May 15th until September 30th of 2015. If you do not have a lot of time, it is better to leave this for another visit. VERY IMPORTANT. The Kremlin is closed on Thursdays. There are two types of tickets the General Entry for adults and the Free Entry for those under the age of 16. 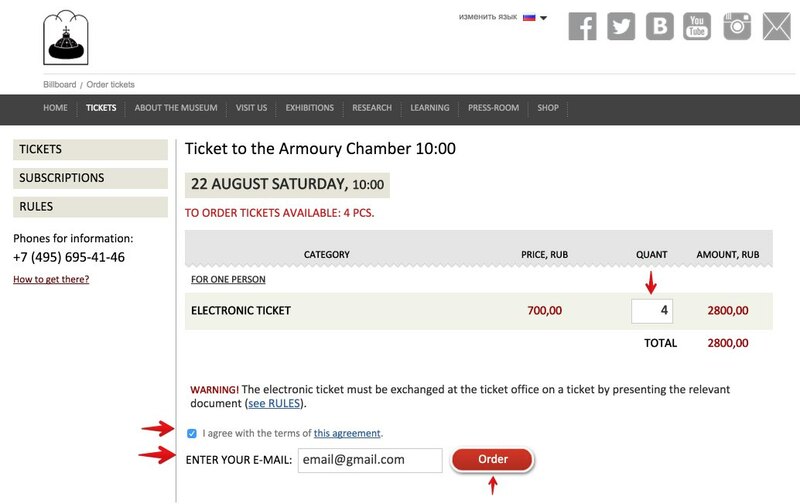 On the official website for the Kremlin (only for General Entry tickets, not for Free Entry tickets). You can get tickets online both for the Armory as well as for the Cathedral Square. At the Kremlin ticket booths, which are located in Aleksandrovsky Sad (Alexander’s Gardens), 45 minutes before the beginning of the session. The ticket offices are open from 9:30AM until 4:30PM (from 9:00AM to 5:00PM during the high season, from May 15th to September 30th). There are also machines that dispense tickets but these are only available in Russian. During the high season, long lines form at the ticket booths. Also, it is possible that you may want to plan your visit to the Armory at a specific time and there may not be any tickets left for that time. For these reasons, it is a good idea to buy your tickets in advance, which are sold a maximum of 14 days in advance. Those younger than 16 years old can get in free but their tickets cannot be purchased online. 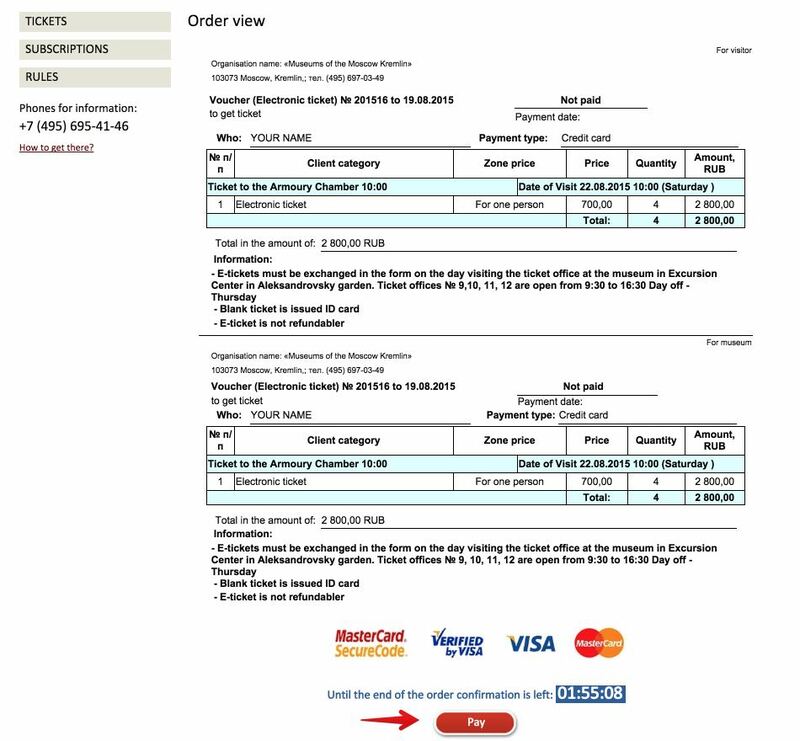 According to the general conditions for buying tickets online (part 7), which are only in Russian, tickets are refundable up until 3 hours before the entry time, however the process for getting your money back is a Little bureaucratic: you must fill out a form that you can find at this link and send a scanned copy via email to this address: tickets-vozvrat@kremlin.museum.ru. Is it worth it to buy tickets online? It depends. If you want to visit the Armory museum during the summer months and you are not going with anyone younger than 16 years old, then it is worth it. If you’re visit is outside of the high season or if you are going with anyone younger than 16 years old or if you are going to visit just the Cathedral Square, then maybe it would not be worth it, in this case perhaps it would be better to arrive early at the Kremlin ticket booths and buy your tickets there directly. 4. 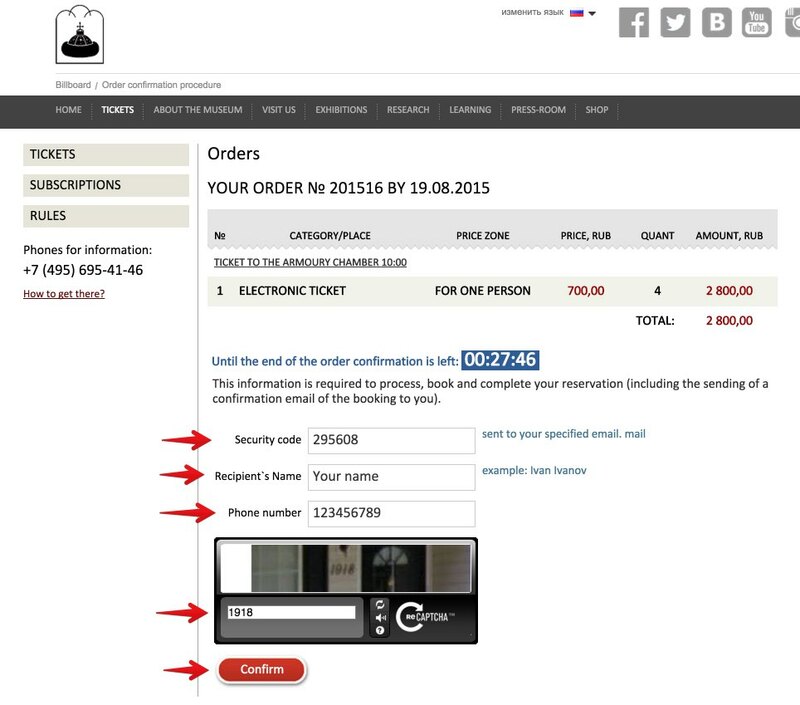 Next you should review to make sure that everything is correct and make the payment using you credit card. 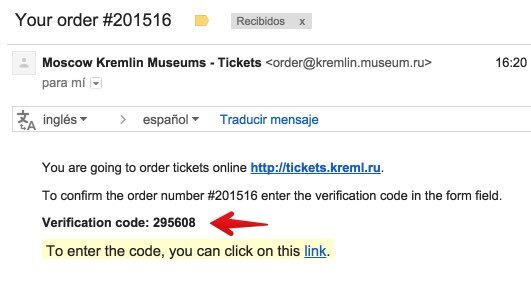 In your email, you will receive a link to download a voucher, which can be exchanged 45 minutes in advance of the time of your visit at ticket booths number 9, 10, 11, and 12 (open from 9:30AM to 4:30PM). In this way there should not be much of a line at the ticket booths. 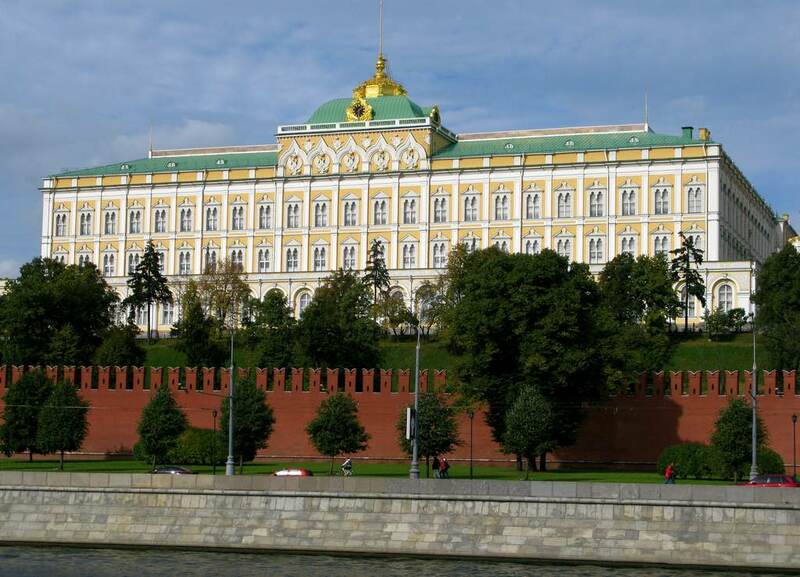 I hope that this article has helped you to understand the Kremlin and plan your visit.